The Silverthorne CO real estate market welcomes the Rivers Edge at Silverthorne condo complex, with only a few condos remaining for sale. These new residences boast a fantastic location within walking distance to the Silverthorne Recreation Center, the Blue River Recreation Path, the Outlet Stores, and 225 feet of frontage on the fly-fishing waters of the Blue River. The I-70 corridor is only minutes away, offering accessibility to Denver, Vail and more. Rivers Edge at Silverthorne consists of 31 residences and boasts sustainable green features, low HOA dues and scenic mountain views. The large units offer open floorplans and vaulted ceilings in the penthouse residences, in-floor radiant heat, oversized windows, granite countertops and high-end appliances. Rivers Edge at Silverthorne condos are also pre-wired for surround sound, high-speed internet and cable TV. Homeowners will also enjoy lots of cabinets and closets for storage, hardwood floors and stained Knotty Pine and Alder trim. The Silverthorne Recreation Center sits across the street offering 65,000 square feet of space that includes 4 swimming pools, 3 slides, indoor basketball and volleyball, an indoor running track, cardiovascular exercise rooms, free weights, sauna and steam rooms and conference facilities. The center is adjacent to Rainbow Park with clay tennis courts, soccer fields, children’s playground, sand volleyball courts and a skate park. In addition, the Silverthorne Pavilion is walking distance from the complex, as well as the new $9 million Silverthorne Theatre and Performing Arts Center. 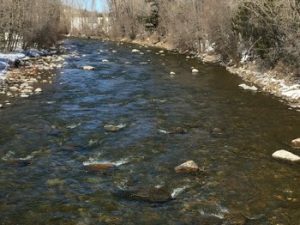 If you’re interested in more information on the Rivers Edge at Silverthorne condo complex, or any Silverthorne condos for sale, don’t hesitate to reach out to Justin & Krystal Knott at LIV Sotheby’s International Realty at 970.333.9050 or knott@sothebysrealty.com. There don't appear to be any properties matching your requirements! ResideInSummit.com Copyright © 2019 JKK Real Estate, Inc., Realtor®, All rights reserved.